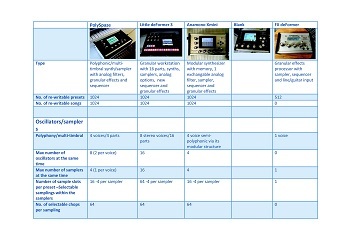 Based on the output stage of the Emu SP12/SP1200. The input signal is converted to 12 bit digital (switchable to 6 bit for absolute lo-fi), and goes into a 24dB SSI2144 analog low pass filter. The sample rate can be adjusted and modulated from 0 KHz (audio stopped) to around 60 KHz. 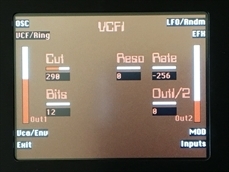 On output 2, an analog fuzz effect is added. 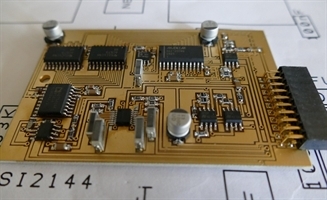 V2 is using the new SSI2144 filterchip instead of the original SSM2044. Sound is the same. On Anamono X go to "More..>Common>Filter Settings", and set either filter 1 or 2 to: 6-SP Filter, depending on in which filter slot you installed it. 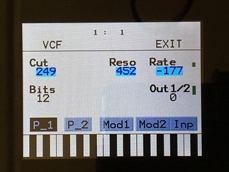 On Xmini go to "Edit>More...>VCF Type", and set the filter to: 6-SP Filter. Rate: Sample Rate. 0 to 60 KHz. Bits: Bit depth. 12 or 6 bit. Out1/2: Adds an analog Fuzz effect, when turned up.